» What Makes You Attractive? We May Now Know What Makes You Attractive! Ever wonder what makes you attractive? Researchers wonder too. Dr. René Proyer from the Institute of Psychology at MLU claims that his recent research has uncovered the secret of being attractive. Playfulness is what makes you attractive. According to Dr. Proyer, it’s is one of the most charming ways of engaging with others. Researchers have long studied the phenomena of playfulness in children. But until recently, research on playfulness in adult relationships has been virtually nonexistent. “Models of childhood playfulness have often been transferred to adults. This results in the loss of many aspects including those related to romantic relationships or intellectual performance,” explains Dr. Proyer. Playful people are able to reframe situations in their lives to maximize their amusement and their ability to be resilient. This wasn’t a small study. Dr. Proyer examined adult playfulness in the lives of almost 3,000 people. He found that playfulness has an overlap, but no real redundancy with the big five personality traits frequently used to describe personality. These are extraversion, agreeableness, conscientiousness, openness to experience, and emotional stability. “Playfulness is an independent personality trait that shares certain aspects with these five global dimensions but which cannot be interchanged,” explains Dr. Proyer. The study also shows that people who see themselves as playful are also seen by others that way. Furthermore, playful people display this trait in a multitude of circumstances and social contexts. How Many Kinds of Playfulness Are There? “There are people who like to tease and playfully engage acquaintances, friends, and intimate others. Dr. Proyer calls this other-directed playfulness. Then there are perpetually light-heartedly people who consider life itself as a game. Their playfulness is on display 24/7. Some people are intellectually playful. They are self-amusing and treat thoughts and ideas as toys. They seek to avoid tedium and boredom with the power of their imaginations. Then there are the whimsically playful. They are the people watchers, who are constantly amused by human foibles and novel situations. The studies reveal that the fact that playfulness in adults occurs across these four different dimensions is part of its charm. But notions of playfulness can be culture-bound. For example, playfulness is often frowned upon in Germany, where playful people are seen as unreliable or lacking sufficient gravitas. But research suggests that this assessment is unfair. One of the strengths of playfulness is the robust capacity to shift perspectives, discovering novel approaches to stubborn problems. Playfulness and creativity are twins separated at birth. What’s interesting about playfulness is that although it has no direct bearing on human survival, it projects a distinct relational message. To women, playfulness sends the signal that a potential partner is non-threatening. To men, playfulness in a woman is a sign of vibrancy and vitality. 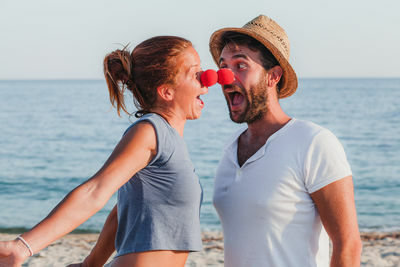 “Playfulness also seems important for the choice of partner — at least more so than the partner having a degree, good genes or being religious…Although we should be cautious while interpreting the data, this could be an indication that playful people are actually perceived as more attractive partners or that playfulness increasingly develops in the relationship.” Dr. René Proyer. What Makes You Attractive to Your Playful Partner? Playful people are also particularly keen for their partners to be playful right back at them as well. Dr. Proyer also reports that playfulness in adult relationships may also tend to increase health and well-being. It might be the give and take, the back and forth, of playfulness that is so compelling. Playfulness is predicated on mutuality and a healthy and vibrant pattern of interactions. “…individuals perceive playfulness as being beneficial to well-functioning romantic relationships by increasing the well-being of the partners, by maintaining the relationships’ excitement, and by conveying the each individual’s affection for his or her partner, and—more generally speaking—by more deeply cultivating the relationship. Dr. René Proyer. I often find that a consistent complaint among couples in therapy is that they feel an acute “fun deficit.” When husbands over-focus on their careers and wives create child-centric households, the capacity for adult playfulness is often pushed to the margins. Playfulness is sometimes seen as irresponsible, immature, or even dangerous. Playfulness can be dangerous… if it’s neglected.